I'll be the first person to admit that my palate is strongly influenced by the Western Hemisphere. I'm a guy that looks for Burgers and pizza over Caldereta and Mechado. I lived in the United States when I was around three years old, and moved back here to the Philippines when I was six, and I still remember the first thing I ate when I got back here was, Believe it or not.. Spam. That's because I took a look at all these strange looking meats drenched in sauces, all with different colors and thinking to myself, "What a strange country I'm living in". My Yaya then made me try the wonder that is Liempo, which I instantly loved. From there, she slowly broke me in to more exotic local dishes, which not coincidentally, were predominantly meat based. 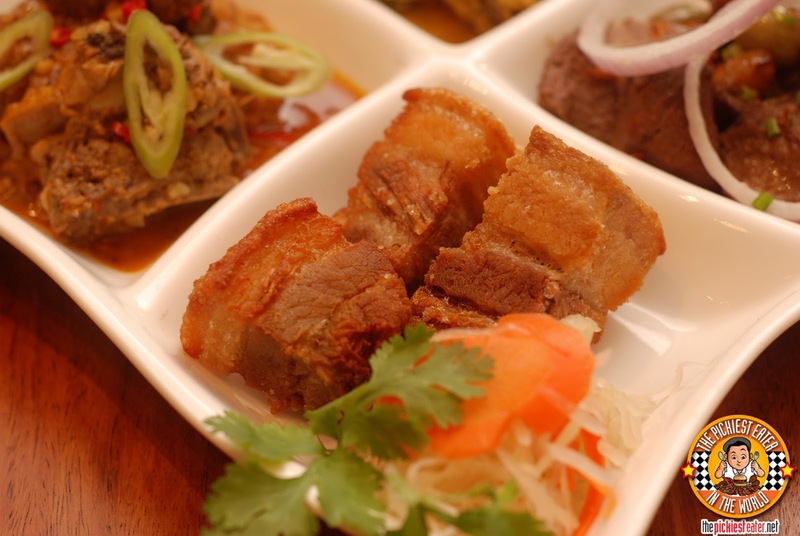 Through the years, my appreciation for the food of my homeland has grown exponentially, but I still wouldn't consider myself a huge fan of Filipino Cuisine. One lunch at Chef Tatung's changed all that. 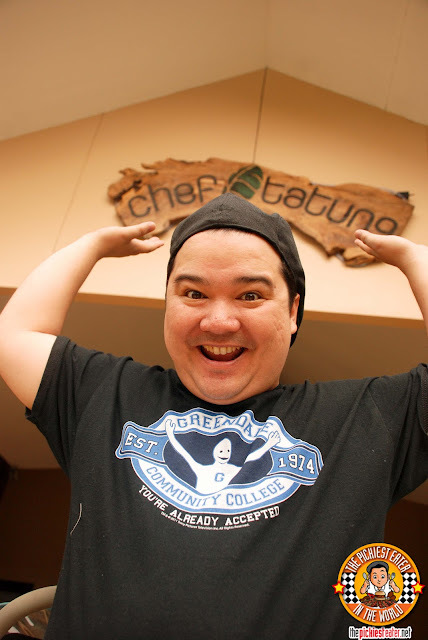 Myke Sarthou, or "Chef Tatung" as he is more popularly known, gained fame for opening a restaurant within the walls of his Quezon City home. As in, the man literally put tables in his sala and backyard, and welcome people into his house for a night of private dining, and eventually a full blown restaurant. On strong word of mouth, people just lined up to his front door to get a taste of "Chef Tatung's Garden Cafe". 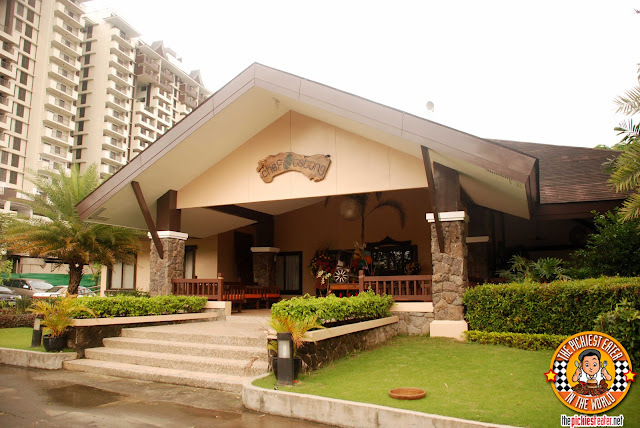 Eventually it became clear that the business just became too big for their home to accomodate, so they made their move to a bigger location in Acacia Estates in Taguig. It must be an overwhelming feeling for Chef Tatung, standing in front of the gorgeous structure that now houses his restaurant, knowing that all of this started from meals he would prepare in his own humble kitchen. 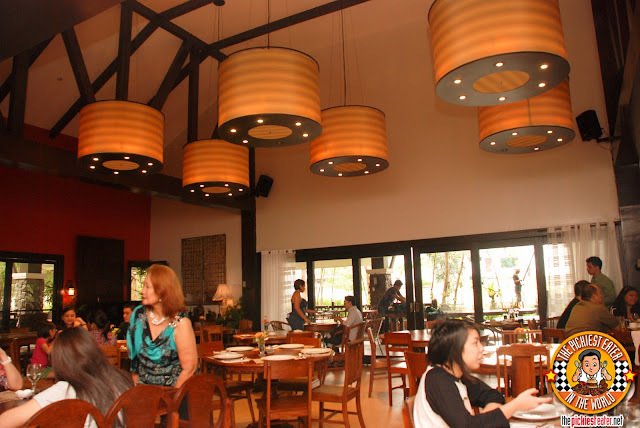 Though it is only located in Taguig, going to Chef Tatung's gives you an out of town vibe that adds to the unique dining experience. Acacia Estates is a charming compound that houses several DMCI projects, and is shaping up to become a lovely community. I really hope they maintain the cleanliness and how organized everything is. Though it is undoubtedly a full fledged restaurant, as you walk into Chef Tatung's, you can't help but feel you're still in the home of the Chef.. Maybe somewhat of a Summer vacation house. What was once a decent sized backyard with lush greens has now been replaced with a spacious open air veranda, with comfortable couches. On a breezy day, I promise you, you would not want to leave. 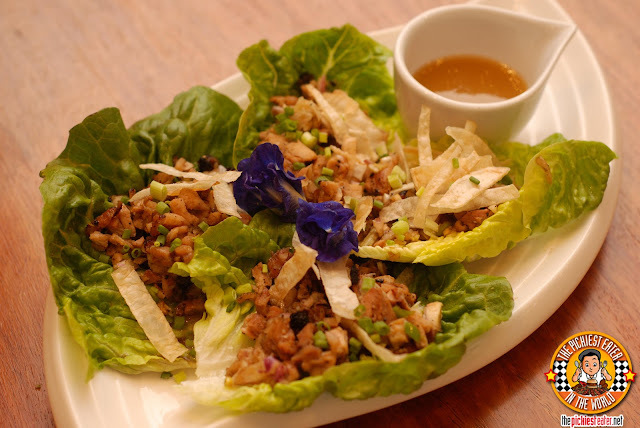 We kicked off our meal with the Chicken Sisig Lettuce Wraps (P330). Clearly I'm not a fan of greens (I feel eating greens takes away the food source of animals, such as pork and Beef.. err.. I mean Pigs and Cows), this was actually really good. It was bits of Grilled chicken mixed with onions, Green Chili and topped with Taro Chips, served in a leaf of lettuce for you to wrap. Also, the dipping sauce was made of mango, that gave it a nice sweet-citric flavor. Chef Tatung took the classic Lumpiang Ubod and elevated it to another level, creating the Lumpiang Ubod in Flavored Crepes (P145). Inside is the traditional lumpiang ubod filling.. Stir-fried vegetables and tofu, instead of using the common lumpiang ubod wrapper, Chef Tatung created three different "Crepes" for you to enjoy. Between the Pandan, Ube, and Egg (Closer to the original), I couldn't choose which one i liked most! Also, the sweet dipping sauce melded with it perfectly. 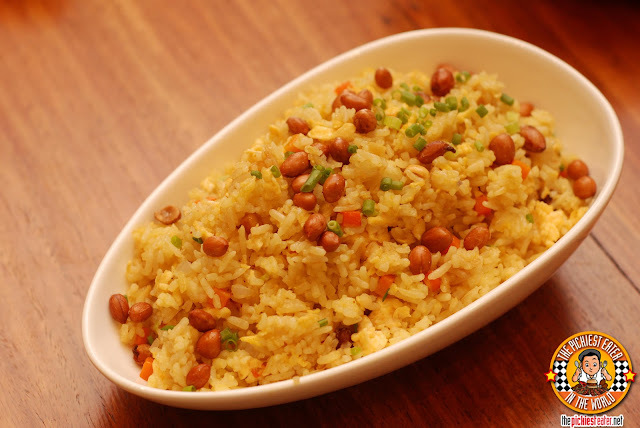 Something that you MUST eat your meal with is, Tatung’s Fried Rice (210). It's a wonderful medley of peanuts, egg, shrimps, and spring onions. It was so good, I didn't even realize there wasn't any meat in it! (And no, Shrimp doesn't count as "meat" in my book) It was pretty much a meal in itself, and the perfect companion to all the dishes we tried. As a huge fan of shrimps, Chef Tatung's Sugpo with Aligue Sauce (P580) got a big thumbs up from Rina. 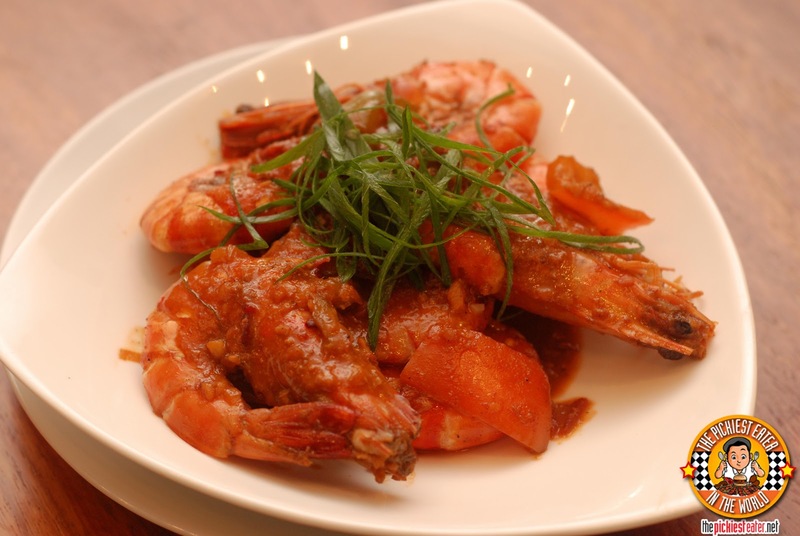 The plump Tiger Prawns were bathed in a rich crab fat sauce that Rina said worked together beautifully. Although she was careful to not eat too much of it, lest her cholesterol levels skyrocket. It seemed Chef Tatung couldn't decide which of his Adobo dishes to add into the menu, so he finally said "Ah screw it!" and put in four of his favorite ones. 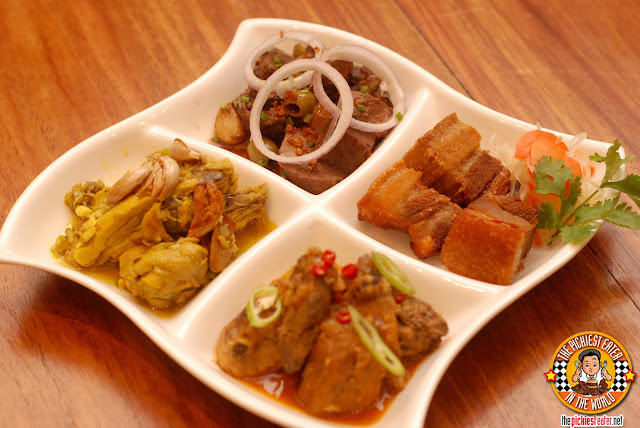 For those who enjoy a good Adobo and are worried you'd feel the same anxiety when being forced which variant to order, an Adobo Sampler (P1200) is available. 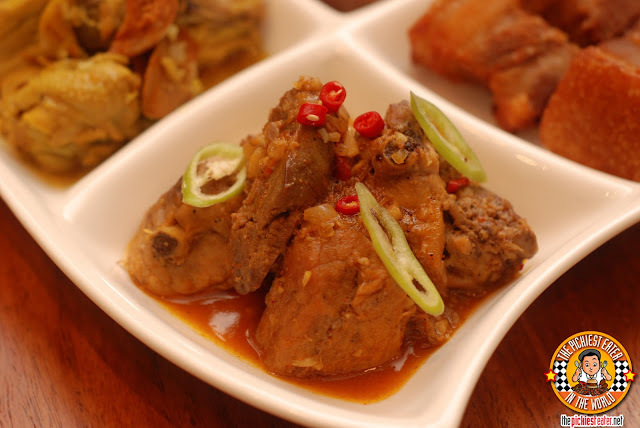 One of the variants is the Yellow Chicken Adobo, which is the Batangas Style of cooking the classic Pinoy dish. The chicken is stewed in fresh ginger, and soaks deep into the chicken meat, creating a wonderful flavor. 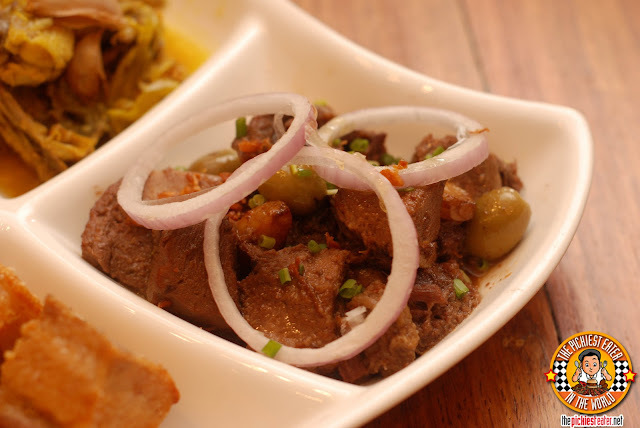 I also tasted the Chicken-Pork Adobong Ilonggo (P380), where the meat was rendered with annatto seeds and chicken liver. Ironically, even though I don't eat chicken liver, I really enjoyed this, especially when I mixed the sauce into the Tatung's Rice. Rina, really enjoyed it, and commented on how tender the lengua itself was. It was basically cooked the traditional tagalog way,with soy sauce and vinegar, then drizzled with Olive Oil, and garnished with roasted garlic and green olives. Care to guess what was my favorite Adobo in the Sampler? Apparently, what looked like a stray piece of Lechon Kawali turned out to be Adobo Bisaya (P380). Chef Tatung explaned that the Cebuano style of cooking adobo is, after marinating the pork in garlic, vinegar, and sweet bay leaves, the pork is slow cooked in lard. Afterwards, it is deep fried until it gets to a perfect golden crisp. 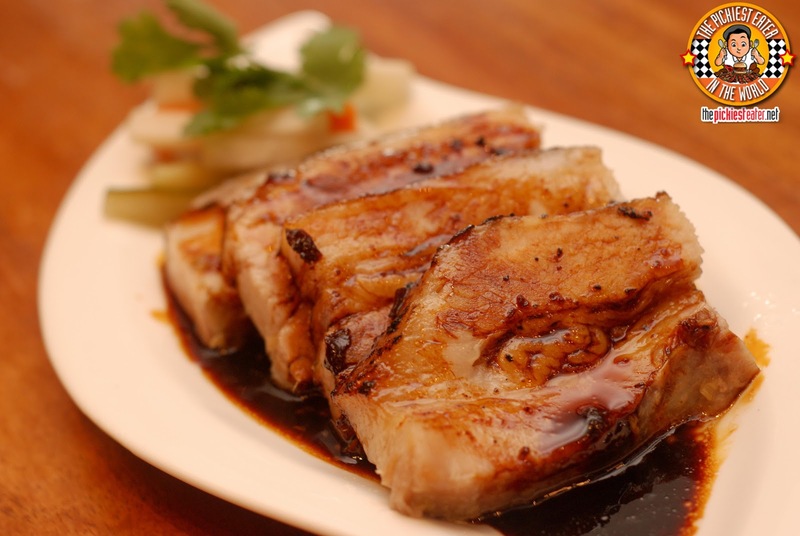 You get light touch of acid on the pork, and the right mix of tender pork, on crispy skin. By the way, all portions of the adobo you're looking at is from the Sampler..
All Ala Carte orders of Adobo are good for 2-3 people. Although I enjoyed everything I ate at Chef Tatung, there were three dishes that absolutely blew my mind to smithereens. The second mind blowing dish, was the oddly named Pokipoki Gratin (P340). 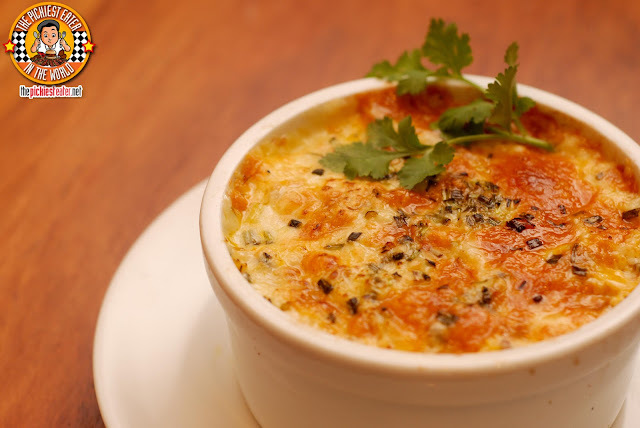 Just looking at it, with the melted Carabao mozzarella cheese and speckles of different herbs on top, was enough to get your mouth watering. Scooping the Pokipoki gratin revealed a stunning layer of eggplant, egg, tomato, and Vigan Longanisa, whose flavors just exploded in your mouth. The acid of the tomato was countered by the richness of the cheese and egg, with the Longganisa and eggplant adding a bit of a savory touch. This was AMAZING. Spanky was right. Masarap kumain ng Pokipoki! Throughout my life as a blogger, you've seen me eat a whole lot of pork. If you put together the amount of pork I've eaten in a life time, you'd have yourself one well populated piggery. So you know I'm serious when I say, the Honey Glazed Slow-Roasted Lechon (P540) is one of the most incredible pieces of pork I've ever had inside my mouth. Think about it.. "Honey Glazed Slow-Roasted Lechon". You know there's not a wonder in there that I don't love? I know I shouldn't flatter myself, but to this very day, I believe that this dish was prepared specifically with me in mind. I am a fan of sweet meat, and I have always said that if you put the words "Honey Glazed" in front of anything in a menu, there's a strong chance that I'll order it. If you do the same with "Slow-roasted", It will definitely attract my attention. And not to mention, everyone knows that I drop everything I'm doing when I hear the word "Lechon". This was truly fantastic. It's every pork lover's dream. The slow roasting got the pork to become so so tender, when it's in your mouth, you could barely discern the meat from fat.. until you continue to chew a little bit longer and you start feeling the fat melting into your mouth. The honey glaze also had the ideal amount of sweetness to it, playing it just right so it doesn't overpower the star of the show, which was undoubtedly the pork. 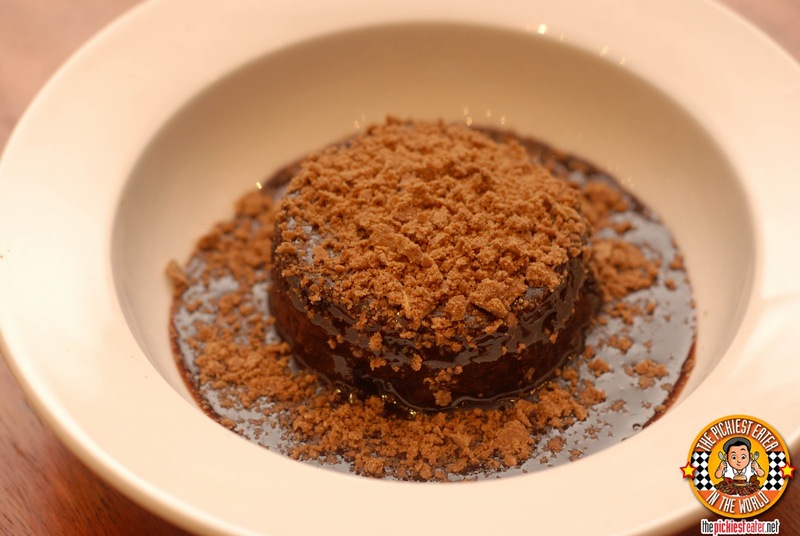 For dessert, we had the Warm Tsoknut Chocolate Cake (P100). The cake itself was incredibly moist, and the chocolate that it was covered in had a darkness that Rina really loves (I'm more of a milk chocolate kind of guy). I recommend you add The Pichi-Pichi with Quezo de Bola (P100) as a dessert that you MUST Try before you move into the afterlife. This is yet another one of Chef Tatung's creations that really knocked it out of the park. 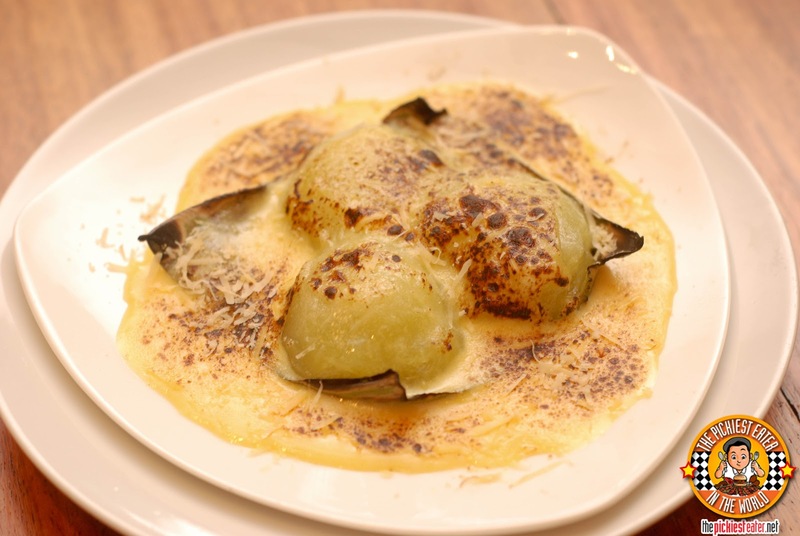 Imagine the pandan flavored dumplings covered in a custard sauce (sort of like leche flan) then covered in Quezo De Bola that they torched to get the "brulee" feel to it. Chef Tatung himself approached me during midbite.. And when I saw mid-bite I mean Mid-foodgasm, and asked "So how do you like your Pichi-Pichi?". My mouth was full, and I was busy enjoying the awesomeness that it was, so all I could really do was slowly chew and roll my eyes around.. He laughed, understanding what I meant.. Although clearly a little bit creeped out as well. You look away from Baby Rain for a second, and she sticks her hand in a coffee cup. Thank god it wasn't hot!! 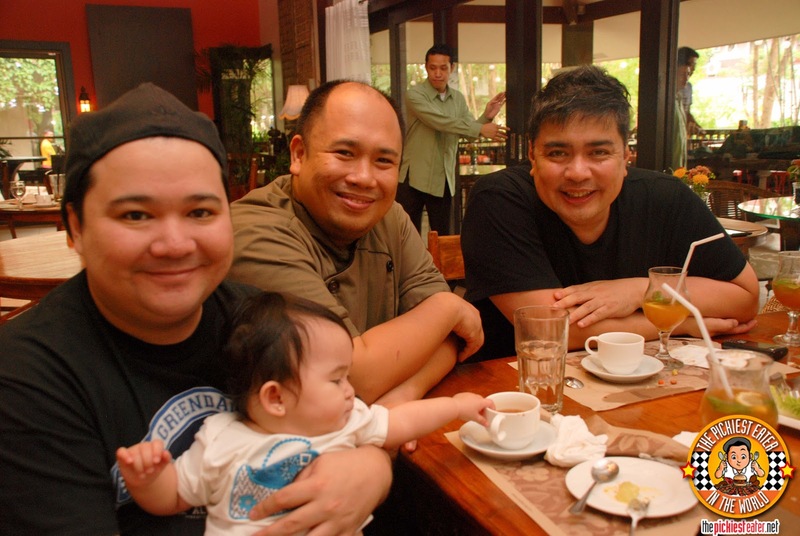 I had met him once, briefly, during the Launch of Breakfast Magazine, butthis was the first time for me to actually try Chef Tatung's food, and as evidence by that animated gif above, my mind was blown. Chef explained to me that he's a huge fan of Filipino food, and isn't really looking for ways to change it. Sure, he adds a new twist here and there, but the basic recipes are the same that he has learned through the years. 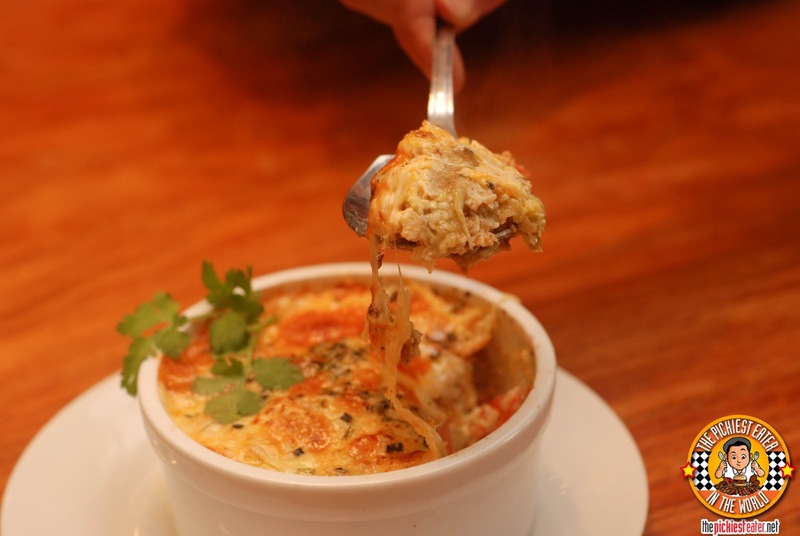 Maybe he'll experiment with plating and presentation, but he sees nothing wrong with sticking to tradition. All this from a chef with no culinary training whatsoever. Are you fricking Kidding me? 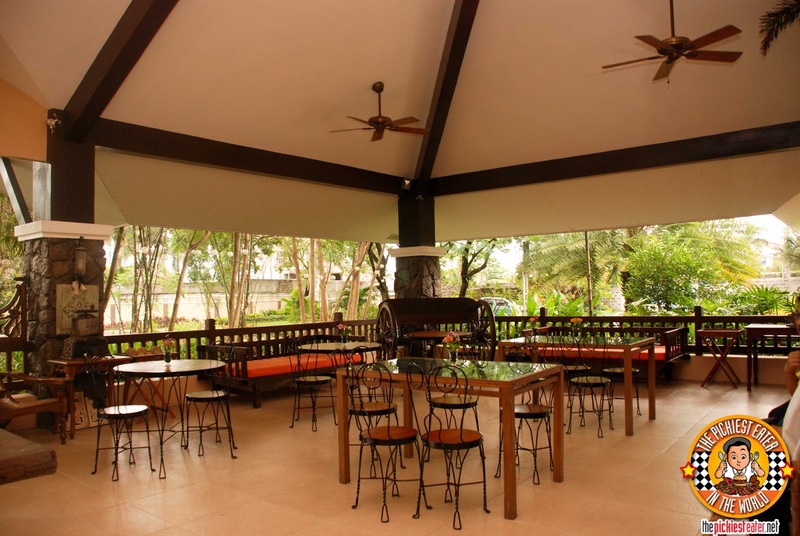 Chef Tatung's Main restaurant is up and running at Acacia Estates, but they're not done developing just yet. In the works is a bunch of Function halls for events, and they currently have an ongoing Sunday Buffet (P650) where they feature my favorite CEBU LECHON!! Price wise? Yes, it's a little bit on the upscale side, but you're not just paying for the food, but for the entire experience as well. In my opinion, the price is well worth it. OMG! where'd you get the community shirt? Man, that honey glazed slow roasted lechon is something else! It really is.. i get hungry just remembering it!! I'm sure the food's really delicious, but no way am I going to pay P1,200 for adobo! The prices (except for the dessert) are ridiculous! To be fair, The P1,200 was for the Sampler.. A solo Adobo dish that's good for 2-3 people goes for P380. Oh my! That Honey Glazed Slow-Roasted Lechon looks so delectable. 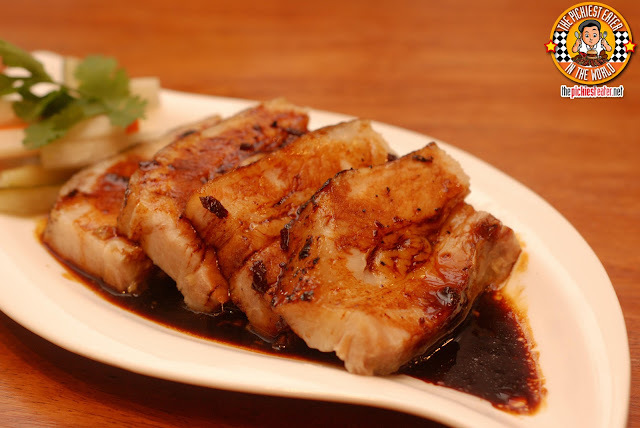 I am almost drooling imagining the melt in your mouth goodness of this awesome piece of pork. 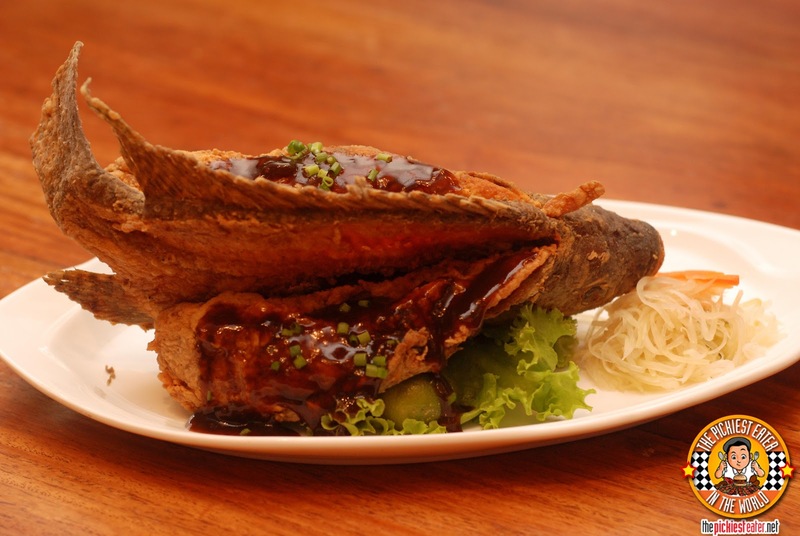 I'm glad to be walking-distance away from Chef Tatung's in times like these, the pics are making me hungry. 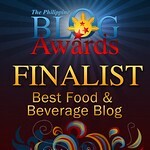 I totally agree with you, the Honey-Glazed Lechon and Pichi Pichi are MUST-TRY! No need to thank me, Hazel.. It's a tough Job but someone's gotta do it! haha!